The thing about living in Canada is that we have (sort of) two Thanksgivings. Americans probably don’t notice ours, which comes in early October, but it’s impossible to miss the cascade of Facebook posts, news articles and—if nothing else—the onslaught of holiday music that marks American Thanksgiving. A few years ago, a friend said, “to me, every day is Thanksgiving.” (Except, I’m assuming, without the turkey, stuffing and political fights). At the time, that seemed kind of radical, though after five years of daily gratitude-journal practice, and two years of exchanging nightly “3 gratitude” emails with a friend, I feel the same way. It really is embedded—dare I say wired—into me. Even when I feel crappy, I can always find something good that lifts my mood, if only briefly. That’s the cumulative effect of regular gratitude practice. It rewires the brain. The caveat is that the feeling has to come from within. I really liked this piece from the Greater Good Science Center on “The Trouble with Thanksgiving Gratitude.” The article talks about the importance of gratitude as an organic, internal experience rather than an obligation, as well as the importance of going deep and exploring why we’re grateful for something—what feelings does it bring out in us? What qualities does it have? It also offers some wonderful ways to make gratitude more personal (and interpersonal) in your gathering. Overall, though, I prefer the word appreciation to gratitude, because gratitude carries a moral tone to it. As in, “You should be grateful, young man!” And as I’ve written before, the word gratitude carries within it all the threats of what-otherwise-might-be. It’s a heavy word, with a lot of baggage. Don’t get me wrong: I’m truly grateful for a lot of things, like having food to eat and a roof over my head—things that, in the not-too-distant past, I haven’t had or have come close to losing. But just the act of noting that gratitude reminds me, however subtly, of what it was like when I didn’t have them. Appreciation is lighter, because even if there are challenges in parts of my life, there are still always things to appreciate. Nonetheless, gratitude—the concept and the word—is an important part of my life. It’s not a moral thing for me. I rarely do things because I’m supposed to. It’s an emotional thing, a practice of meaning rather than morality. It genuinely makes me feel better to focus on what’s good, even—especially—when other things are challenging. And sometimes, all I can muster is an intellectual, neck-up observation like, “I guess I’m grateful to be able to breathe.” (Well, yeah…I’d really hate the opposite). Or the best I can do is to notice that the sky is a particularly vibrant blue. If I’m feeling really down, the observation may not shift my mood in that moment, but it’s keeping the neural pathways for appreciation open—which helps in the long run. For example, the photo at the top of this post is a storm drain in my town. I noticed this—after living here seven years!—one day when I went walking with the intention of finding new things to appreciate in my environment, things I’d never seen before. This storm drain is a beautiful piece of art. Just looking at it made me smile. 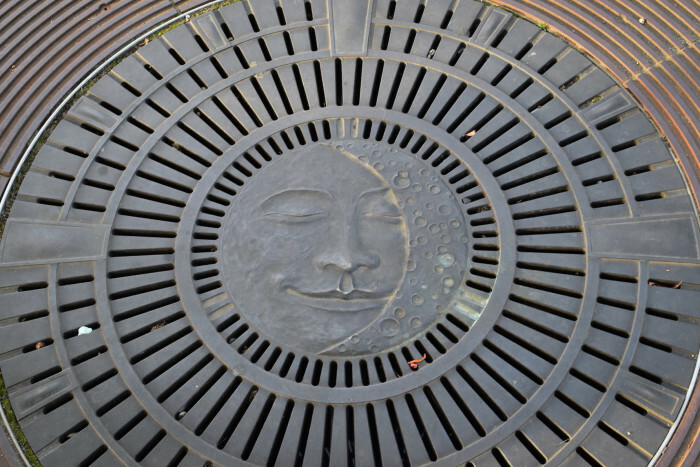 And now, whenever I walk by (or over) it, I remember to look for the face, the sun and moon, always smiling serenely. Gratitude isn’t about denying any difficulties, but rather, it’s about shifting focus momentarily, so I can keep my neural pathways balanced between positive and negative, instead of just ruminating on the negative. As with most people, without active re-training, the pathways for negativity would—and did—take over my brain. This isn’t a Pollyanna approach; it’s a long-term investment in my emotional well-being. And when there are real challenges around basic survival issues, keeping those positive pathways going is the key to my emotional survival. In case you didn’t catch that link up there, I’ll repeat it here: Gratitude and appreciation are great examples of neuroplasticity practices (“neurons that fire together, wire together”) The more I look for—allow myself to see—what’s likeable in the mess, the more likeable things I train myself to notice, just as a painter notices more nuances in the quality of light than the rest of us. I love Rick Hanson’s phrase for this: “Taking in the Good”. There’s absolutely no resistance, no denial, no pressure: It’s just noticing what’s there. There’s the evolutionary bias towards negativity, which is best summed up as: if our ancestors stopped to appreciate a sunset, they were likely to wind up as some lion’s dinner. As a species, we’re wired to notice what’s different, what’s dangerous, what’s threatening. But in 21st-century North America, our lion-avoidance skills have advanced significantly (isn’t there an app for that now? ), yet our nervous systems haven’t gotten the message. So it’s up to us to consciously cultivate the neural pathways that balance the negative and the positive. Once you get past the evolutionary bias, there’s still a cultural bias: We live in a culture that places a disproportionate value on being able to analyze and find problems. We tend to view people who are happy, or who see things positively as simplistic, as not smart enough to understand all the things that are so very wrong in the world. (Side note: being able to appreciate is a form of intelligence, too.) Being cynical, snide or snarky is a covert way of flaunting one’s intellectually superiority. I know. I did it for decades, and my brain will still sometimes go for the quick cynical comment or snarky joke–until I notice the ego that’s driving it. Critical thinking is an essential skill, of course, but by valuing it to the exclusion of appreciative thinking, we’re wiring our brains for negativity…and for me, at least, that can have dire personal consequences.